The second gathering to Re-imagine the General Assembly will be held on Sunday, July 29, after the General Assembly, at 19th and Telegraph (approximately 3:30/4:00 to 6:00). The goal is to “get down to business” about concrete ways to improve the OOGA. Small group discussions will cover topics and concerns brought up by participants at this event, as well as those that came up in our survey responses and at the first gathering. Possible areas of discussion include what should happen at GAs; what kinds of facilitation do we want; and how do we want to interact with each other. This will be a chance to develop ideas about the GA process and format, and to connect with other people for further discussion or to draft proposals. 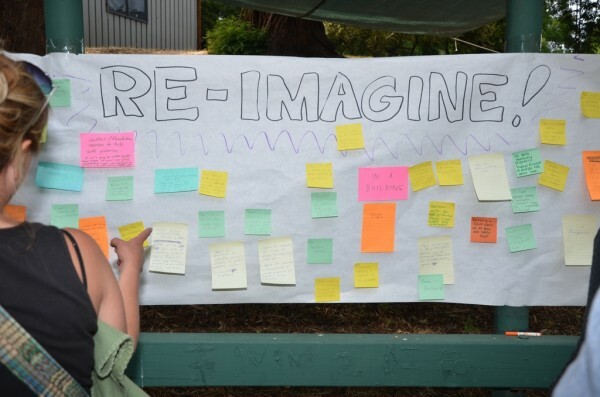 The purpose of the Re-Imagine the General Assembly working group is to facilitate a space where people can come together to address their general concerns and/or desired changes for the General Assembly. We have worked hard to address and respond to the feedback we’ve received throughout this process.